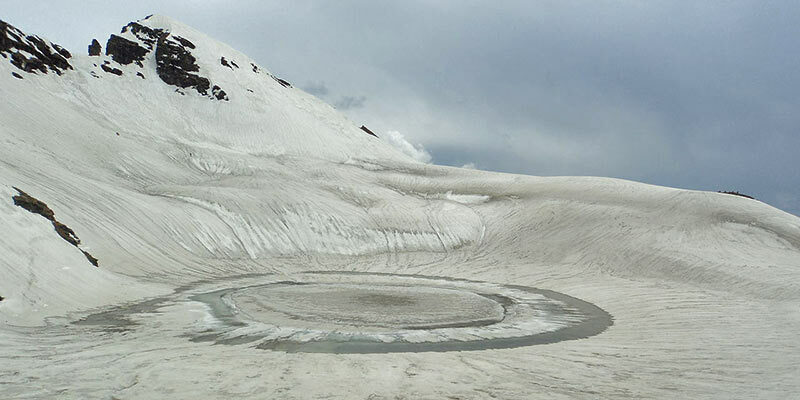 Trek up to the Bhrigu Lake located in the Kullu Valley of Himachal Pradesh to admire the creativity of nature. Explorers are often motivated to venture out on the trek by their lust to absorb the beauty of the lake and the meadows that surround it. One can also find sheep and horses grazing amongst the cedar and birch trees found here. Both the lake and the meadow keep changing from time to time according to the ongoing season and the prevalent weather. The lake is considered to be sacred as mythological legends claim that the great Sage Bhrig had conducted rituals along the shores of the lake. Many locals also believe that the Gods have the Kullu Valley have visited the lake and taken a dip in it. Both first timers and experienced hikers can go on this 14,000 ft. high trek which can be considered moderately difficult. It generally begins from the Gulaba base camp which is only an hour’s drive from Manali. The lake falls towards the eastern side of the Rohtang Pass and offers visitors access to some of the best mountainous campsites nestled in the Himalayas. From here one can admire the view of natural wonders such as the Seven Sister Peaks or Deo Tibba, the Pir Panjal Ranges and the Hanuman Tibba. Wildlife enthusiasts could try to spot species like snowcocks, pheasants and the Himalayan Monal. Idealy following the classic itinerary, it takes about four days to reach the famous and beautiful Bhrigu Lake from its base camp at Gulaba. But these days various options are available to trekkers. This is a very unlikely itinerary and only a very experibced trekker should attempt this. You can start your trek from Vashisht on day one. Vashisht is about an hour away from Manali. From Vashisht one could trek towards the Bhrigu Lake. After spending the night at a campsite on the second day one could trek back to Vashisht and then head to Manali or they could directly trek back to Manali. On the first day head towards the Gulaba Base Camp from Manali. Start trekking from Gulaba and stop at Rola Kohli. On the next day resume your journey and start trekking towards the Bhrigu Lake. Once you are done admiring the beauty of the lake return to Rola Kohli. On the last day trek back to Gulaba and from there venture towards Manali. On the first day from Manali venture towards Gulaba which is the starting point of the trail. Begin the trek by heading towards the Gulaba Meadows Camp. On the second day while moving towards Rola Kohli pass through virgin forests and get wonderful views of the Hanuman Tibba and the Seven Sisters Peak. On the third day head to the Bhrigu Lake and then return back. Finally, on the fourth day put your gears in reverse and return to Gulaba from where you can travel to Manali. Reach Manali then take a trip to Jogini Falls or Vashisht on day one. On the next day drive to the Kulang Village and trek to Moridugh. On the third day trek to Tenta via Panduropa. On the fourth day trail towards the Bhrigu lake and then move downwards to the Gulaba camping grounds. On the last day trek towards Kothi and then drive to Manali. Day 1: Reach Manali. Visit Jogini Falls to Vashisht. You should also carry a day pack which should contain water bottles, a medical kit and some light snacks. Toothbrushes, toothpaste, hand sanitisers, and sanitary napkins. You must carry Ziploc’s to store used napkins so that you can dispose them at a proper place after the trek. To maintain their hygiene trekkers should carry their own cutlery like spoons, coffee mugs and tiffin boxes. You carry some cloth bags to store wet clothes. ORS, Betadine or any antiseptic cream, Move spray (aches and sprains), anti-fungal powder, and a knee cap for those who are prone to knee injuries. You should also carry a fully charged camera which has a large memory card and some extra batteries. You also need to carry some important documents like the original copy and a photocopy of a government identity card (drivers’ licence, voters id, pan card, etc), a medical certificate and a disclaimer form. The trek is a moderately easy one and can be attempted by first-timers too. But one needs to adapt to lower oxygen levels and has to be prepared to cover at least 9kms in six hours. You need to improve your cardiovascular endurance and perform activities like walking, jogging, squatting, and stair climbing routinely for at least one month before the trip. That bellow 45 can slowly increase their pace of jogging and by the last week of the month, they need to cover 5 km in less than 35 minutes. Those above 45 could do the same if they are comfortable in doing so or they can opt for brisk walking and should be able to cover 10kms within 90 minutes. Although trekkers only reach a height of 14,000 ft. on the trek, due to the forced ascent they could suffer from Acute Mountain Sickness (AMS) as their body doesn’t have enough time to acclimatize to the changing oxygen levels. So, the health, oxygen level, and the pulse rate of trekkers should be checked routinely. Trekkers should carry proper medical kits and proper high-altitude trek equipment’s like portable oxygen cylinders, tents and sleeping bags. It is very important that you drink at least 4 litres of water every day and have proper meals. It is advised that trekkers go on a preventive course of Diamox which thickens bloods and helps trekkers to acclimatize to the mountainous climate. But it’s a sulpha-based drug so those with sulpha allergies should avoid it. Apart from AMS, one could also suffer from HAPE or HACE so it’s important that the trekkers read their symptoms and take precautions. From the middle of May till the month of October trekkers can freely trek in the region so individuals should plan accordingly. Visitors should aim to conduct their trek before June or after August to avoid landslides which are prevalent during the monsoon. In the summer season, the temperature varies from about 20-25C in the daytime and falls to 5-7C at night. In winter the temperature falls to about 10-15C around daytime and nearly 0 to -7C at night. The entire lake freezes in the winters because of the immensely cold temperatures. Those who want to admire the snow could also visit the lake in the early summers. 6) Can I Go on Bhrigu Lake Trek? Those who have an interest in trekking or mountaineering should go on the Bhrigu lake trek. The trekker must be fit and should be able to cover at least 5 km in 45 minutes with ease. The climber should be able to handle the weight of backpacks weighing at least 10 kgs. Individuals who suffer from heart problems, high blood pressure, asthma, and epilepsy should not venture on this trek. Generally, one ventures out on the Bhrigu Lake Trek from the Gulaba base camp which is about 24km away from Manali. There are buses which can transport visitors from Manali to Gulaba and vice versa. You could also start your trek from Vashisht which is about an hour away from Manali. You could go to Manali directly by train or plane or you could travel to Delhi and take public or private buses to Manali. Q1.What accommodation is available during the trek? Ans. 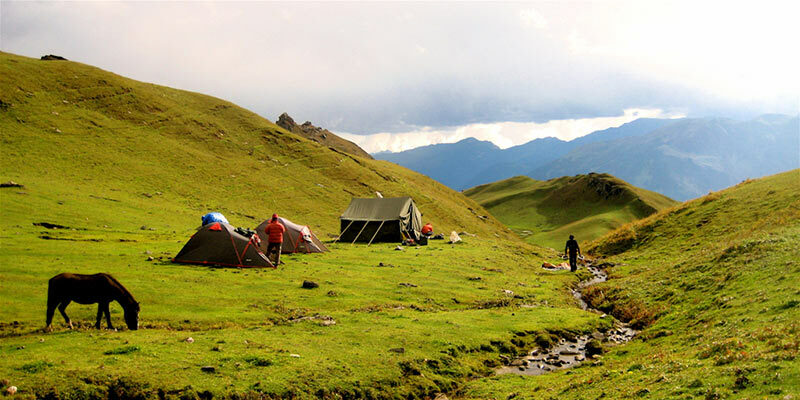 There are campsites present throughout the Bhrigu Trek Trial. Q2.What is the best time to venture out on the trek? Ans. Before June and after August is the best time to go on the trek. Q3.How do we reach Manali? Ans. You could reach Manali by air, bus or train. The nearest airport is the Kullu airport, while the nearest railway station is at Ambala Cant. One can also board private or public buses from Delhi to reach Manali. Q4.How fit do I need to get? Ans. The trek is fairly easy but you have to routinely perform activities like swimming, squatting, jogging, walking, and stair climbing to enhance your cardio vascular abilities. You need to be able to walk for at least 7 to 8 hours in a day. Q5.What are the basic necessities for the trip? Ans. Woollen Clothes, caps, jackets, socks, gloves, thermal wear, trekking pants, trekking shoes, toiletries, water bottles, lunch boxes, sun glasses, sun caps, sun-cream, medication, torches, batteries, trekking pole, and rain coats. Q6.What kind of shoes will be ideal for the trek? Ans. High ankle trekking shoes are ideal for trekking in such regions. The shoes should have thick souls. Q7. Is it possible to receive mobile connectivity? Ans. Mobile networks don’t work properly in this region. Vodafone and BSNL signals can be received but inconsistently. Q8.How long do climbers have to trek every day? Ans. Climbers have to be prepared to trek a distance of about 8 to 15 kilometres per day. Q9.What is the trek distance? Ans. Generally, a 3- or 4-day trek covers 24 to 26 kilometres. Q10. Is the trek safe for girls? Ans. The trek is safe for girls and in camp sites it ensured that girls share tents. Q11. Will it be safe to consume alcohol on the trip? Ans. Consuming alcohol on such heights can be injurious to health. Also, alcohol can lead to dehydration. Q12. What kind of toilet facilities are available? Separate toilets are available for men and women at the campsites. Q13. What should my medical kit contain? Ans. First aid equipment like cotton, bandages and sanitisers; fever medicines; diarrhoea medicines; nausea medicines like Diamox. Q14.Is the trek ideal for first timers? Ans. Since the trek is only moderately tough first timers won’t face a lot of difficulties. Bhrigu Lake would leave a great memory with you that will be etched in your minds forever.